The Alisal Certified Farmers’ Market is located in East Salinas at 632 East Alisal Street in the parking lot of the WIC Family and Community Nutrition Programs. Plenty of free parking is located next to the Alisal Market. Monterey Salinas Transit bus routes go directly to the Alisal Market. 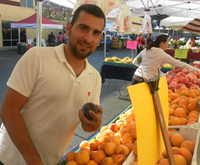 At the Alisal Certified Farmers’ Market you will find fresh quality fruits and vegetables (many certified organic) from small-scale family farmers. When you shop at California Certified Farmers’ Market you are supporting CA growers and your local community. The Alisal Certified Farmers’ Market is supported by the WIC Family and Community Nutrition Programs and Haynes Charitable Foundation.